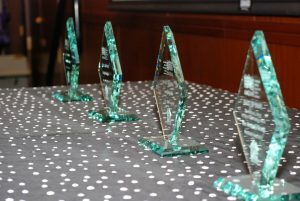 On May 5, NVAHA hosted the fifth annual AHOME Housing Hall of Fame Awards Ceremony and Reception, a celebration of the careers and achievements of three outstanding housing leaders, at the NRECA Conference Center in Arlington. 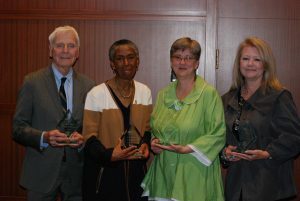 Housing colleagues from across the region gathered to honor the 2017 awardees – Fairfax County Supervisor Cathy Hudgins, former Arlington County Chair and Board member Mary Hynes, and Walter Webdale, President/CEO, AHC Inc.
A new award was created in memory of Bill Berry, a successful residential developer and industry leader, and a founding member of AHOME. The William L. Berry Inclusive Communities Award was presented to The Bozzuto Group for their development of and support for affordable communities throughout the region. We congratulate all of the award winners and thank them for their commitment and leadership in promoting housing affordability for the region, and advocating for creative policies and resources to expand affordable housing opportunities in Northern Virginia. Diane Yentel, President/CEO of the National Low Income Housing Coalition was our thoughtful and inspirational keynote speaker, and she rounded out the evening with a spirited call to action, speaking out against the devastating cuts to federal housing programs proposed for HUD’s FY18 budget. Another important announcement that evening was the official merger of AHOME and NVAHA. The two organizations entered into discussions last summer to join operations. After deliberations by both boards our bylaws were amended, and the necessary paperwork was filed to merge the organizations under name of the Northern Virginia Affordable Housing Alliance. expanding NVAHA’s technical assistance capacity to support jurisdictions and elected officials. With a revised mission statement and a strengthened organization, we will continue to be the voice for housing policy in Northern Virginia, working to expand the political will for strong public policies and adequate financial resources to meet our region’s needs for housing that is affordable. A heartfelt thank you to all our sponsors and colleagues who joined us for this special celebration – we hope you enjoyed it as much as we did. Be sure to check out the pictures from our reception!